Would you believe that the first few paragraphs of this blog were written on my iPad mid-flight as we headed off to Portugal on our holidays last JULY! Where has the time gone? While it has been a ridiculously hectic year, it has been a particularly good one. With our numerous completed Placelift home renovation and refurbishment projects along with closing in on the completion of our own self-build, we are certainly looking forward to our Christmas break - say you are to! Before leaving for our summer holidays and leaving our self-build (our baby) behind, we had made superb progress. After a fair few nights of tossing and turning, we finally focused in on the finer detail of our window order. Who would have thought a RAL number could come between us and a good night’s sleep? I'm a serious believer in following your gut and that's what sealed the deal in the end. Our external windows are dark and bold in RAL 7016 Anthracite Grey and in-keeping with our planned facade vision. 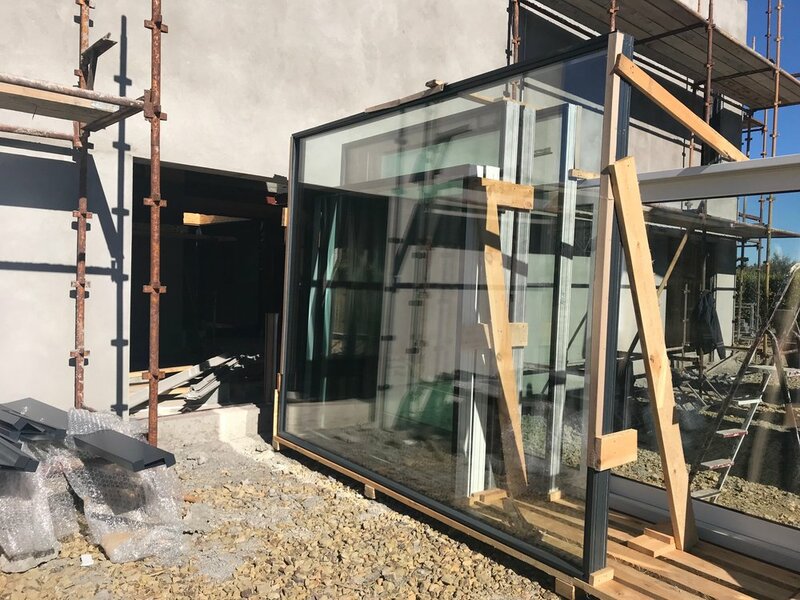 With our internal courtyard planted in the heart of our home, we wanted to make its presence as impactful as possible, so we went with a dual RAL the same colour as our exterior windows and doors. Elsewhere, we simply wanted our windows and doors to frame the views and subtly blend into our planned contemporary colour scheme, so we went for RAL 9003 Signal White. We decided upon tilt and turn windows in all areas coupled with large fixed panels and we absolutely LOVE our simple but extra wide front door with no side panels. The materials for our roof arrived literally within hours of us having to leave for the airport for our holidays. Ivan had the mammoth task of stock piling all the components and wrapping to protect from the elements. While we were away the work commenced on our roof. It was weird not being able to pop over to the site (especially for Ivan) to check out the progress, but luckily the contractor sent us some great photographs including the one below which clearly shows our internal courtyard opening in the roof. Roof with our internal courtyard open to the elements. Following our holiday, we had a casual meeting on site with our architect Declan. It was funny to witness his excitement at the progress, he was loving this as much as we were! A quick meet up on site is never a quick meet up! It's hilarious when we start talking about one aspect and before we know it, we are on to the next discussing and bouncing ideas off each other. I LOVE IT! Declan is extremely passionate about his work and he has a powerful knowledge and wealth of experience on contemporary projects. I must admit that when he and Ivan get all technical discussing the likes of cold ridges, I tend to switch off and veer my thoughts towards the exciting #finishes, #interior styling, #interiorinspro and #curatingtheperfecthome. We are looking forward to finishing our stairs. While sounding somewhat contradictory, we want it to be discreet but interesting and at the same time to pack a punch. Our stairs will be illuminated by a combination of natural lighting (from a tall window at the top left) and with a statement pendant fitting above, leading us into our master bedroom retreat. Below are just a few clippings on our ideas board in our office to guide us along the way. This however, is only a drop in the ocean as we have conjured up a stock pile of images on our Pinterest, Houzz and Instagram platforms! While Ivan's focus was centred on all things roofing and insulation, I was in the midst of planning the interior layout of every nook and cranny of our new home. With such a vast open plan design, spatial planning was instrumental to defining each space and creating the perfect balance and flow. Having visual layout options for every room and open plan space offered a myriad of benefits. Working closely with our interior architect Lynn, was so much fun and she did a truely amazing job! These plans have proven invaluable, in terms of our kitchen, electrical and lighting planning. That saying “failing to plan is planning to fail” is so true! Later on, there is no doubt that these layouts will make our storage planning a piece of cake and guide us on our choice of furniture. As property renovators, we regular come across homes where it's apparent the design and function were not fully thought out and planned at the outset. Unfortunately, this results in rooms and spaces not working and adding to the frustration of the homeowner. In saying this, most homes can be remodelled and improved upon with the help of a professional. House sealed tight, what a delight! We were blessed with the glorious summer extending right through into October. Our windows were fitted over two days in the middle of September under a clear blue sky and some scorching sunshine. Our large slider took ten men using all their strength to get this baby installed! I could barely watch, as one wrong move could have proven disasterous. Having our new home finally sealed was a major milestone and gave us a huge sense of achievement and relief at the same time. As you can see above we finally have a front door key to our new home. When I went over the day after the door was installed, as I was putting the key in the door our two dogs where at my heels waiting to enter - up until now they could have picked any window or door opening and entered at ease. We were lucky to get the final aspect of our roof completed with fibreglass before the weather turned and winter made its presence known. Our first fix electrics and plumbing went very smoothly but with these came a plethora of decisions. Thankfully, our floor layouts and electrical and lighting plan played a blinder, making everyone’s life easier. We got our local printer, Absolute Print to enlargen and laminate our plans and then we stuck them on the glass window of our courtyard so that our contractors could easily refer to them. For our lighting plan, we were mindful that we didn’t want to pepper our home with downlighters but instead use them only where required. Otherwise, the plan was all about adding interest with eye catching pendants, clever wall lighting and some carefully located LED lighting. In terms of a smart home, I personally feel that a smart home is a home that has as little electrical current exposure as possible. As we spend so much time in our homes, we should be aware and take some control over this aspect. When we leave our homes, we have little or no control over our exposure for example in our workplace, cinema or in a shopping centre. Research has proven that this is having a negative impact on our health and well-being (effecting some individuals more that others). Of course we will have fibre braodband and a certain amount of LED lighting but we will be in a position to power off at night to at least provide us with some respite from the digital society we now live in. Our main bathroom is well on track and our raised platform is ready for our freestanding bath and wet-room area. We went with wall-hung wares and are aiming to keep this space as streamlined as possible. The photo below seems to capture the essence of our underfloor heating system in all it’s glory, installed by BM Plumbing Solutions! We can’t wait to get this going in the new year and experience warmth underfoot (warmth anywhere at this stage would be great). In fact, we can’t wait to get our ESB connected early in the new year and get the heating on (which is an air to water system) so that we can dry out the entire house. Our floors were poured in the middle of October and left to dry out over a couple of days. When you smell the aroma of fresh plaster, you know you are well on the way to a fresh new living space. All of our internal and external walls are completed warm boarded and plastered and looking amazing thanks to Rob! With our stairs installed, it has made a powerful impact by seamlessly connecting the ground floor to our upper level. We are so delighted with the views from our bedroom windows and can’t wait to share them with you!. We have a small roof light in our walk-in-wardrobe for natural lighting and a modest but cute en-suite. We were delighted with the space created under our stairs, so we are going to utilise this for smart storage and will kit it out, when we know exactly what and how we want to store. New house sealed tight with windows, doors and roof. With Christmas just upon us, we have some BIG but EXCITING decisions to make in terms of our finishes. Kitchen, worktops, appliances, flooring, wall and floor tiles and furniture to name just a few. We are lucky to work with so many great suppliers, so we are really looking forward to finally working with them on our very own house project. The plan is to do as much homework as possible over the Christmas break and then hit the ground running in January in terms of our choices. Once we have the main functional and practical elements in place, we are happy to take our time and avoid rushing any aspect. So, when we have our new beds, kitchen and bathrooms, we should be good to make the BIG MOVE with our children, two dogs and a cat in toe! Below is the youngest, who was a mere 8 weeks old when we started our self build journey! We look forward to updating you in early 2019, but in the meantime, we hope you and your family ENJOY A WONDERFUL CHRISTMAS & ALL THE VERY BEST FOR 2019!